Andrew Flintoff has announced his retirement from all forms of cricket "with disappointment and sadness". The injury-plagued all-rounder, 32, revealed the decision came after consultation with medical advisers. He said: "Having been told my body would no longer stand up to the rigours of cricket, I had no alternative." Lancashire star Flintoff played a key role in England's Ashes successes of 2005 and 2009 but had been dogged by ankle and knee problems in his career. He added in a statement: "I was told the problems I have been trying to overcome in rehab for the last year, following the latest of a series of operations, would not recover sufficiently to allow a comeback. "I would like to thank my family, Lancashire, England, all my sponsors, friends and advisers for all the help and support they have given me throughout my career. "Last, but by no means least, I am indebted to the encouragement and support I have always received from England's magnificent supporters. "I will now be taking a break before deciding which future direction to take." Flintoff retired from Test cricket at the end of the 2009 Ashes series, having a second knee operation two days later, while turning down the offer of a new central contract from the England and Wales Cricket Board. However, he repeatedly expressed his desire "to be the best one-day player in the world" and underlined his continued commitment to his country for limited-overs matches. Flintoff signed a new three-year contract with Lancashire in November 2009 while undergoing injury rehabilitation in Dubai but was forced to call off a planned comeback for the county's 2nd XI this summer. Although he was named in Indian Premier League side Chennai Super Kings' provisional squad for the Champions League Twenty20 and his agent Andrew Chandler revealed that Flintoff was close to signing a deal to play domestic Twenty20 cricket for Queensland, fears grew that he might never represent England again. And after electing to turn down a third knee operation, he has decided to end his professional playing career. In 79 Tests, he scored 3,845 runs at an average of 31.77, with five centuries - and although he captured 226 wickets at 32.78, he only took five wickets in an innings on three occasions. 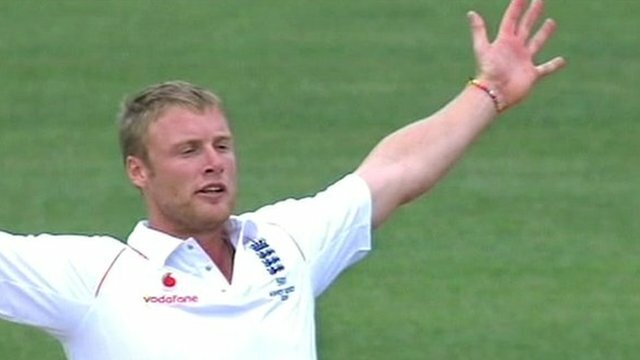 Born in Preston, Flintoff made his reputation in schoolboy cricket as a hard-hitting right-hander and right-arm fast bowler. Nicknamed 'Freddie' after cartoon character Fred Flintstone, he made his Test debut against South Africa in July 1998 at the age of 20. England had struggled for much of the 1990s as Australia became the pre-eminent power of the cricketing world and Flintoff was the latest of a number of all-rounders weighed down under the expectation of being "the new Ian Botham". Comparisons with Botham, England's talismanic all-rounder of the 1970s and 1980s, were inevitably made throughout Flintoff's career as both were capable of changing a match with the bat or the ball but also attracted many headlines for their off-field exploits. In his early career, Flintoff was often criticised for carrying too much weight - and his famous response was to celebrate a one-day international victory over India in Mumbai in 2002 by removing his shirt and waving it above his head. Injuries had deprived him of the chance to play against Australia in his early England career - but as the side grew in confidence under coach Duncan Fletcher, the Lancastrian's finest hour came in 2005. 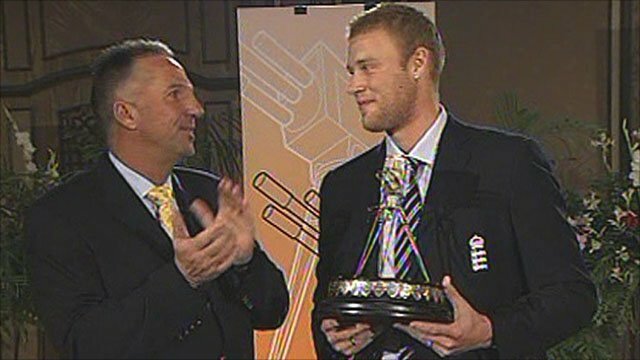 England won an epic series 2-1, and Flintoff's heroic performances earned him the BBC Sports Personality of the Year award. The sight of the big all-rounder consoling Australia's Brett Lee after England's narrow victory in the thrilling second Test became the iconic picture of the series - but he was never to reach those heady heights again. 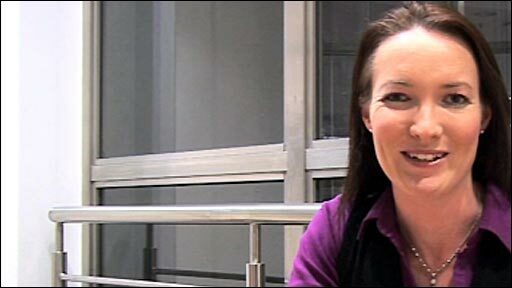 In 2006, with captain Michael Vaughan sidelined by debilitating knee injuries and vice-captain Marcus Trescothick forced home by the illness that would curtail his international career, Flintoff captained England for the first time in India. With Vaughan still absent, Flintoff was chosen ahead of Andrew Strauss as captain for England's ill-fated 2006-07 Ashes defence in Australia. The tourists slumped to a humiliating 5-0 defeat, while Fletcher later revealed that he had to discipline the stand-in skipper for turning up to a practice session with a hangover. Flintoff's off-field behaviour also hit the headlines at the 2007 World Cup in the Caribbean, when he was stripped of the vice-captaincy after a drunken late-night escapade in St Lucia involving a pedalo - memorably dubbed the 'Fredalo' incident. In the latter years of his career, the wear and tear on his body meant Flintoff's injury problems began to mount. Although his batting statistics declined, he remained capable of a devastating game-changing spell with the ball and was usually a safe pair of hands in the slips. As the riches available in Twenty20 cricket increased, it was no surprise when he became the joint most expensive cricketer in the Indian Premier League, when Chennai paid US $1.55m (£1.1m) for his services, although he and the other England players were only available for part of the IPL season and were paid pro rata. It was even less of a surprise when he returned early from the IPL after picking up a knee injury and missed the ICC World Twenty20 - but Flintoff roused his ailing body for one last battle with Australia in the 2009 Ashes series. Despite announcing before the second Test at Lord's that he would be quitting the five-day game at the end of that series, he produced a devastating spell on the final morning of that Test, taking 5-92 in a 115-run victory. His last Test hurrah came at The Oval, where he memorably ran out Australia captain Ricky Ponting with a direct hit from mid-off on the day the Ashes were regained. Flintoff played in the World Cups of 1999, 2003 and 2007. In 141 one-day internationals, he scored 3,394 runs at an average of 32.01, while taking 169 wickets at 24.38.